Oman’s Ambassador to Tehran Saud bin Ahmad Khalid al-Barwani said that his country’s state and private sectors are keen on investing in Iran’s Southeastern port of Chabahar. 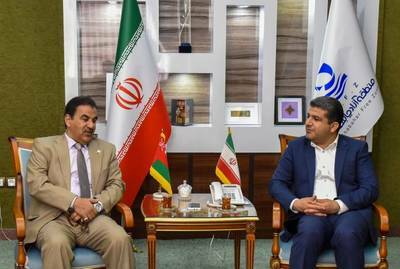 Chabahar is the best center for telecommunications, economic and trade exchange and can play a very significant role to this end, he said during a meeting with the Managing Director of Chabahar Free Trade Zone Abdolrahim Kordi. “Increasing business and economic cooperation between Oman and Iran could lead to the development of relations between the two countries,” al-Barwani said. The ambassador further described Chabahar as the best platform for Iran-Oman relations, adding that the port can play an important role in the development of regional trade in the future. The Omani diplomat expressed Oman’s readiness to implement phase 2 of Chabahr’s Shahid Beheshti port along with the passenger terminal of Shahid Kalantari Port there. In the meeting, the managing director of Chabahar Free Zone Abdulrahim Kurdi, for his part, detailed the commercial and trade capabilities and the potentialities of Chabahar Free Zone, stressing that his organization seeks to provide high-quality services to the investors in order to play a positive role in the relations between Iran and Oman. He further said that Iran-Oman bilateral cooperation plays a positive role in the economic development of the region, adding that the Chabahar Free Zone is ready for more industrial and agricultural investment. He also emphasized that the talks and relations between Oman and Chabahar Free Zone must become operational. While in Chabahar, the Omani ambassador along with his accompanying delegation visited the commercial, transit and tourist facilities of the port and the coastal region of Chabahar.